The busy and hectic holiday shopping season holds the potential for many types of injuries at retail locations. Slips, trips and falls, parking lot car accidents, and even violence can occur as a result of chaotic circumstances at shopping centers. These risks do not just affect shoppers. Retail workers, too, can be injured in these types of accidents. 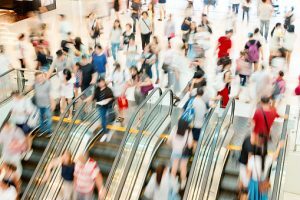 A Rhode Island workers’ compensation attorney can help protect the legal rights of retail employees who are injured at work during the busy holiday shopping season. Some retail property accidents are common. Others are less foreseeable. Such was the case when the roof of a Bristol shopping center collapsed during a snowstorm in March 2017. According to U.S. News and World Report, the affected unit of the Belltower Plaza was empty at the time of the collapse, and no one was injured in the incident. The rest of the plaza was shut down by the fire department and building inspector. Violence can erupt at shopping centers as well. This was the cause of the tragic death of a Westerly man reported by U.S. News and World Report. After a brief, early-morning confrontation in the parking lot of a Westerly shopping center, the man was killed. The Rhode Island Department of Health gave the cause of death as “multiple trauma to the head.” The other man involved in the confrontation has been charged with manslaughter. The Westerly Sun reports that the two men did not know each other prior to the confrontation, and that no weapons were used in the assault. Surveillance video showed the two men involved in a brief physical exchange that lasted fifteen seconds. Some holiday shopping days are especially prone to violence and injuries. According to the Daily Mail, ten people have died in the United States as a result of Black Friday shopping since 2007. The Daily Mail also identifies common Black Friday injuries, including parking lot car accidents and fights for parking spaces; stampede injuries such as crushed organs and broken bones; in-store injuries from falling merchandise or speeding shopping carts; and violent altercations over limited merchandise or restricted deals. These same incidents can injure retail workers as well as shoppers. Any employee who is injured on the job may have access to different sources of compensation for their injuries. Employers carry workers’ compensation coverage to compensate retail workers who are injured on the job. More severe or permanent injuries may also entitle a worker to disability benefits. Finally, if a negligent third party is responsible for the injury, the injured worker may be able to pursue a personal injury claim. Consult with a Rhode Island workers’ compensation attorney as soon as possible after any workplace accident. The hectic holiday shopping season can cause retail workers to sustain injuries on the job, and these injuries may be subject to many different types of compensation. We will help injured workers investigate all potential sources of compensation in order to protect their legal rights. This entry was posted on Wednesday, December 20th, 2017 at 9:28 pm and is filed under workers' compensation. You can follow any responses to this entry through the RSS 2.0 feed. Responses are currently closed, but you can trackback from your own site.